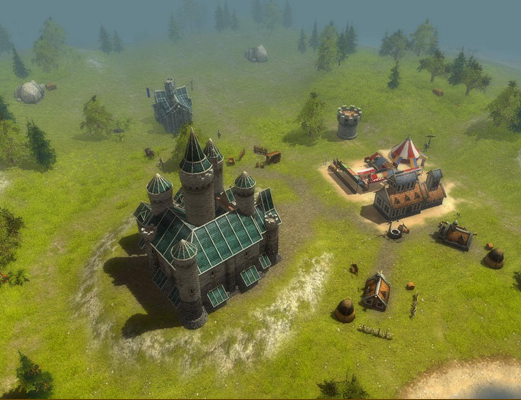 The premise of the game is that you are the rule of Ardania and you have different missions ranging from killing off a faction of units that are disturbing your kingdom, to exploring the map to find special items, to having time limits to making a certain amount of money or accomplishing a certain objective. • Excellent music and voice acting: Each character had something funny or witty to say. The narrator is a national treasure with his Sean Connery accent. • Voice Editor: The ability to create your own voices in the sound editor for heroes. I had my warriors spouting voices from Morrowind. • Heroes: The leveling system of the heroes kept you attached to your higher level heroes. You could name your heroes and watch them get stronger. • Missions Difficulty: It ranged from insanely easy to insanely difficult. I want to watch people beat Elven Treachery and Legendary Heroes in the expansion. They are the hardest missions. • Magic! Magic is another way of influencing the battlefield and the game. It is very expensive so effectively using magic is critical in multiplayer. Majesty 2 instructional video on how to become a king and not die! You are the rightful heir to the throne of Ardania. There’s a demon in your seat. Watch this trailer for further instructions! The timeline is many many years after the original. Thankfully, the narrator can live over 200 years and provide the very necessary "Majesty, a new building is complete!" or "Majesty, the local blacksmith offers new services!" It was a very smart move by Paradox Plaza to have the same voice actor and it will keep fans like me very pleased. There have been some changes. First the game now 3D where the camera can be rotated and zoomed in. The nice graphics remind me of Heroes of Might and Magic 5 which is a good thing. The heroes design have been tweaked in color and look; some of the heroes are now female and I'm not sure if both sexes will be available for a faction. The humor and charm of the original is evident in the CG ratman movie. Paradox Plaza is smart to realize that the hero and cutscene humor was a huge part of the first game to incorporate it into the second game. I expect further bizarre missions like the battle between the ratmen and the goblins. New Flags: Fear and Protection flags. Fear flags cost money to put up a warning sign that is supposed to prevent lower level heroes from entering the area around the flag. I will be using it a lot for my wizards and gnomes since they are weak until they get higher level. The Protection flag is where a target is protected by other heroes motivated by the value of the Protection Flag. I would assume that heroes just walking near the protected unit wouldn't get free gold but the Protection flag could be very useful to protect my high level wizard who likes to get killed very often. New Party system: It looks like there will be more pairing of heroes. In the original, rangers and Krolm would work together to fight monsters. It was an ok setup, but I would have preferred to have a healer paired with Krolm because they like to die. Ability to build all race buildings unlike in Majesty where racial tensions keep some races from being built. Lord ability: where can make one hero a Lord so that he can used in later missions. Great Artifacts: A nice addition adapted from some of the original Majesty missions where there were artifacts. I like how the artifacts acquired go to the King = Me and are not lost on heroes. The website describes an artifact that can heal all heroes at once. This is very powerful and I will try to get those artifacts. On Paradox Plaza’s website, they mention that a demo of Majesty 2 is coming soon. I’ll be there on day 1 for the demo and the ultimate purchase.